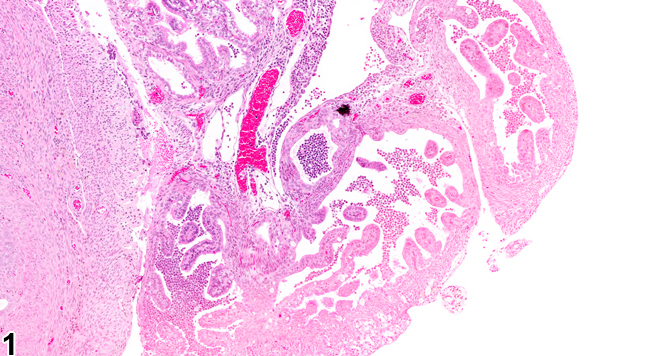 Oviduct - Inflammation, Acute in a female B6C3F1/N mouse from a chronic study. Aggregates of neutrophils are present in the lumen of the oviduct. 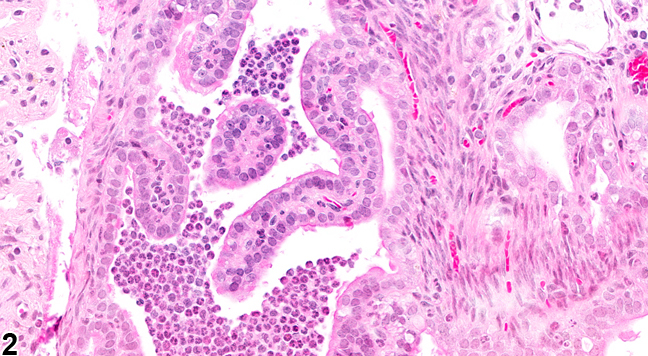 Oviduct - Inflammation, Acute in a female B6C3F1/N mouse from a chronic study (higher magnification of Figure 1). Clusters of neutrophils are present in the oviduct. Oviduct - Inflammation, Acute in a female B6C3F1/N mouse from a chronic study. There are many neutrophils in the oviduct lumen. In NTP studies, there are five standard categories of inflammation: acute, suppurative, chronic, chronic active, and granulomatous. In acute inflammation ( Figure 1 , Figure 2 and Figure 3 ), the predominant infiltrating cell is the neutrophil, though fewer macrophages and lymphocytes may also be present. There may also be evidence of edema or hyperemia. The neutrophil is also the predominant infiltrating cell type in suppurative inflammation, but they are aggregated, and many of them are degenerate (suppurative exudate). Cell debris, both from the resident cell populations and from infiltrating leukocytes, and proteinaceous fluid containing fibrin, fewer macrophages, occasional lymphocytes or plasma cells, and, possibly, an infectious agent may also be present in within the exudate. Grossly, these lesions would be characterized by the presence of pus. The tissue surrounding the exudate may contain fibroblasts, fibrous connective tissue, and mixed inflammatory cells, depending on the chronicity of the lesion. Abscesses are diagnosed histologically as suppurative inflammation. Lymphocytes predominate in chronic inflammation. Lymphocytes also predominate in chronic active inflammation, but there are also a significant number of neutrophils. Both lesions may contain macrophages. Granulomatous inflammation is another form of chronic inflammation, but this diagnosis requires the presence of a significant number of aggregated, large, activated macrophages, epithelioid macrophages, or multinucleated giant cells. Inflammation is differentiated from cellular infiltrates by the presence of other changes, such as edema, hemorrhage, degeneration, necrosis, or other evidence of tissue damage. Inflammatory diseases of the oviducts usually represent an ascending infection from the uterus. A variety of bacterial organisms may cause these infections, but infectious diseases of rodents are now rare. The oviducts, like the uterus, are probably more susceptible to infections in pregnancy or the luteal phase of the estrus cycle. 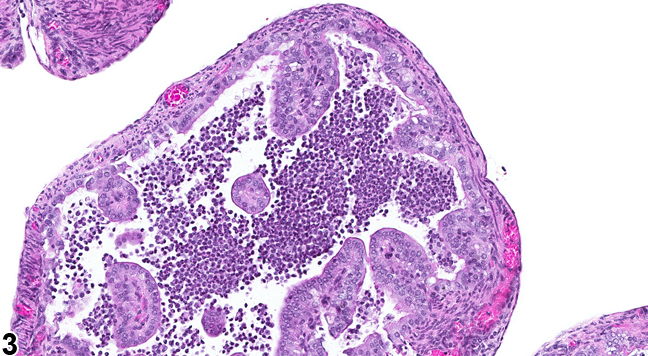 Mycoplasma pulmonis is associated with chronic genital disease, and a purulent oophoritis and salpingitis are the major lesions in the reproductive tract. Oviduct - Inflammation should be diagnosed and graded whenever present. The type of inflammation should be indicated in the diagnosis by use of a qualifier. Lesions secondary to inflammation, such as necrosis, hemorrhage, and edema, should not be diagnosed separately unless warranted by severity but should be described in the pathology narrative. If the inflammation is secondary to another lesions (e.g., necrosis or neoplasia), it should not be diagnosed separately unless warranted by severity, but it should be described in the narrative as a component of the primary lesion. King NW. 1978. The reproductive tract. In: Pathology of Laboratory Animals (Benirschke K, Garner FM, Jones TC, eds). Springer, New York, 509-580. National Toxicology Program. 1998. NTP TR-464. Toxicology and Carcinogenesis Studies of Technical Grade Sodium Xylenesulfonate (CAS No. 1300-72-7) in F344/N Rats and B6C3F1 Mice (Dermal Studies). NTP, Research Triangle Park, NC.